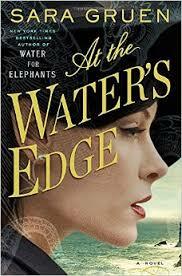 a book chick: "At The Water's Edge"
my take: From the inexhuastible source of World War II comes a tale from the edge of Loch Ness. A bit of a love triangle, bit of magical realism, the Scottish countryside, and the famous monster fill the pages. The story begins in the US during the war with the main characters sailing to Scotland in the midst of German Uboats. The rest of the story takes place in a small country inn where we get the stories of the inn-keepers and how the War has affected life there. I read this quickly and eagerly. Just the thing for my beach-filled vacation days. my source: Daughter Anne handed to me, and she rarely has a hard copy of anything.